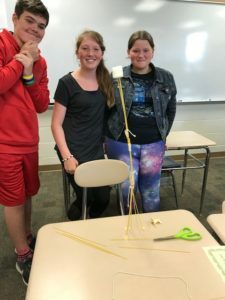 These pictures are from the Marshmallow Challenge done during 7th grade math. 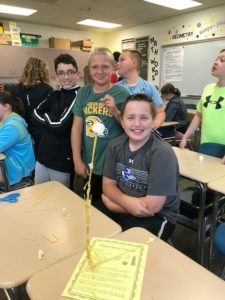 The Challenge was to create a free standing structure with a yard each of tape and string and 20 pieces of spaghetti with a marshmallow placed at the top. 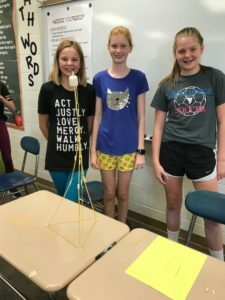 The groups had 9 minutes to work in a small group. 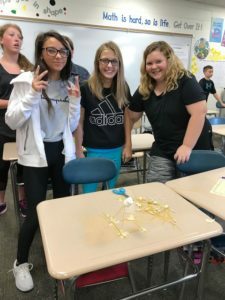 The winners were Charli Wells, Jayda Schroeder, and Katie Jewett with a structure of 26 1/2″ tall.